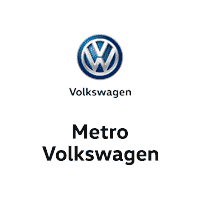 Metro VW is the Dealership near me to find the best deals on the 2019 VW Jetta for sale. How much is a 2019 VW Jetta? 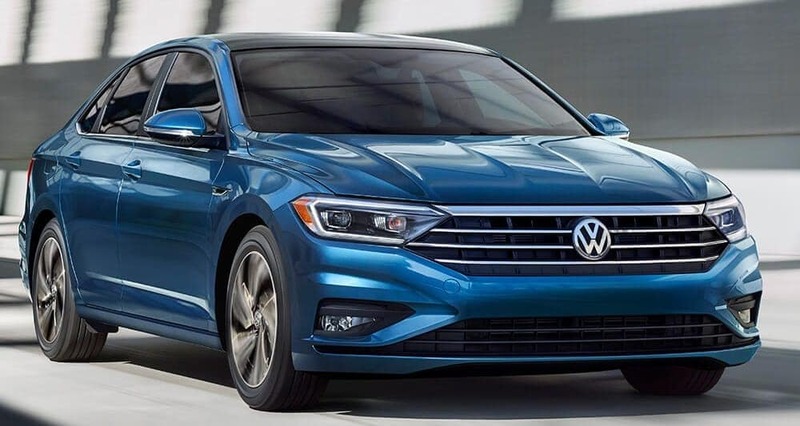 The 2019 Volkswagen VW Jetta in Fort Worth Dallas TX Area located in Irving is a powerful yet extremely fuel efficient sedan that brings you some of today’s most in-demand technology features and several advanced safety features to enable you have an exceptionally polished driving experience. Many cutting-edge driver assistance features have been equipped to sense and adapt to your driving conditions all within a split second, while a blind spot monitor has been made available to help alert you when you inch too close to another vehicle. For instance, if you attempt to change lane when driving, the feature helps to alert you to the presence of other cars that may be in an area where your view is obstructed. The vehicle is intended for shoppers who are looking for a safe and economical commuter that is sleek and stylish. On the inside, the vehicle is inimitable, sophisticated and compelling. The welcoming amount of captivating surfaces and the lush, attractive design stands out, as it complements the ample space that is almost as big as that of a midsize vehicle. The elegant and user-friendly infotainment system makes thing a lot more fun and strikes the chords of interior refinement that you may be looking out for. 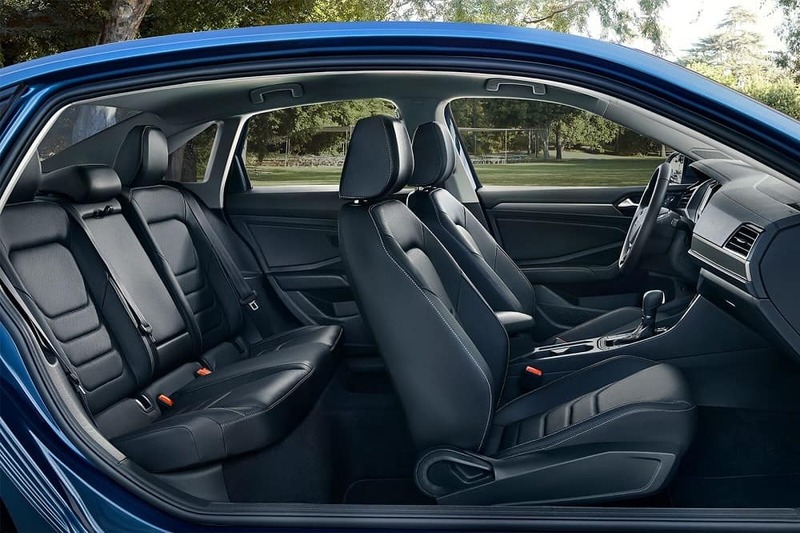 The interior of the 2019 Volkswagen VW Jetta in Fort Worth Dallas TX Area located in Irving is posh-looking and comfortable. It brings the feel of a high-end luxury car to the entry-level sedan category. There are many fancy-looking switches and well-designed air vents to help to deliver comfort. An available soft-touch dashboard allows you to enjoy the expensive look and feel of soft-touch materials all through the dash. The standard seats look quite appealing and provide enough comfort during long journeys. If you want to feel on top of the class, you can opt for the Titan Black Leatherette or Cornsilk Beige leatherette seat options that provide a satisfying, cold-to-the-touch experience that makes you feel better about life each time you step into the interior. The space up front offers enough room for tall adults, while the headroom in the back allows you more than 6-inch friends to travel in comfort without brushing their heads on the roof. Having one of this car makes your friends know that you have achieved success in your life. The cabin is quiet, smart-looking, and incredibly inviting. It has a bit more swagger than you will find in similar cars. Have a grab of the leather-wrapped, multi-function sports steering wheel, and you will appreciate how much fit it feels in your hands. The exterior of the 2019 Volkswagen VW Jetta in Fort Worth Dallas TX Area located in Irving is a symbol of sedan function. Its details stand out and feature an inspiring design that looks unique and functional. The forged-steel door hinges provide incredible strength and help ensure that the vehicle’s doors will always open and close with as much precision as when they were new. Similarly, a laser seam welding fuses metal into a distinct piece along a continues seam to help make the car safer and sturdier. To provide you with an added level of safety, the vehicle incorporates outside mirrors with integrated turn signals to inform other drivers of your intention to turn. The vehicle offers Bi-Xenon headlights as an option. The element features advanced headlights that turn up to 13 degrees around corners even before you do, helping to shine the path ahead of you. You will find the light to be brighter and longer lasting, as they are more efficient than conventional bulbs. To help improve the vehicle’s aerodynamic properties, the manufacturer style the rear and front of the car in a manner that projects a distinctive design. A chrome element has been placed between the Xenon and the LED daytime running lights to underline the headlights on approach. 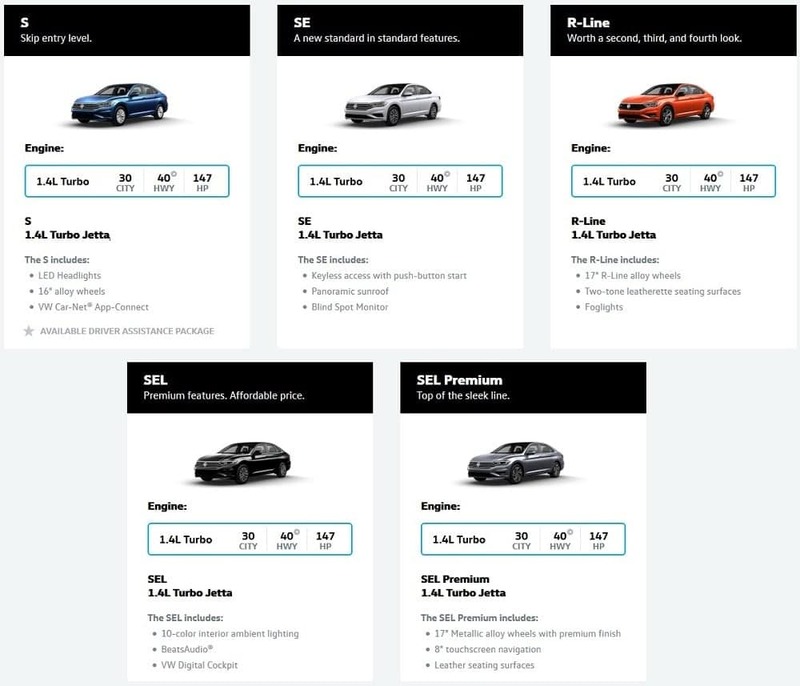 Offered under the hood of the 2019 Volkswagen VW Jetta in Fort Worth Dallas TX Area located in Irving are three engine choices. The popular S and SE modes are equipped with a nice turbocharged 1.4-liter four-cylinder engine with a rating of 150 horsepower and 184 pound feet of torque. On this engine is a five-speed manual transmission. But you can also get an optional six speed automatic is you want. As estimated, its EPA values are 32-mpg combined, 28mpg city and 38mpg highway if you equip it with the automatic. The manual can go 33mpg combined, 28mpg city, and 40mpg highway. These values are very fine figures for a sedan. The SEL trim comes with its own engine – a turbocharged 1.8-liter four-cylinder engine with a rating of 170 horsepower and 184 pound feet of torque. This is also gets a six-speed automatic as its only drive and returns EPA values of 29mpg combined, 25mpg city and 35mpg highway. As for its GLI trim, it is equipped with a turbocharged 2.0-liter four cylinder returning about 210 horsepower and 207 pound feet of torque. It gets a standard six-speed manual transmission or an optional six-speed dual clutch automatic (DSG). It also leaves a fine EPA value of 27mpg combined, 24mpg city and 33mpg highway for its automatic version. While the manual version gets 1mpg less with city driving. S Trim: The S comes with standard 16-inch steel wheels, a 60/40 split rear seat, LED daytime running lights, a rearview camera, fog lights, full power accessories, air conditioning, tilt and telescoping steering wheel, cruise control, heated side mirrors, keyless entry, a height adjustable driver seat, Bluetooth phone and audio connectivity, a 5-inch touchscreen interface, a four speaker sound system, audio connectivity, CD player, auxiliary audio jack as a special USB port. It also gets an optional Cold Weather package. On this package you’ll get heated front seats, and a windshield washer nozzle. Another optional feature is a 16-inch cast aluminum wheel. SE Trim: Here, you’ll get the same features above except for the foglights. Other new features include a 16-inch cast aluminum wheel, heated washer nozzles, blind spot monitoring, leather wrapped steering wheel including a shift knob, plus, heated front seats, a 6.3-inch touchscreen interface, Volkswagen Car-Net App-Connected services, a rear cross traffic alert, and a sunroof. SEL Trim: This takes up from where the SE stops and adds foglights, rain sensing wipers, six-speaker audio system, a cooled glovebox, a six-way power driver seat, dual zone automatic climate control, forward collision warning, adaptive cruise control, chrome exterior accents and automatic emergency braking. GLI Trim: This trim comes as an only one trim level having most of the features above except the adaptive cruise control and forward collision warning/braking. It includes 18-inch cast aluminum wheels, unique exterior styling, a sport tuned suspension, upgraded brakes, front sport seats, front and rear parking sensors, a premium nine speaker Fender audio system laced with a subwoofer, and an auto dimming rearview mirror.